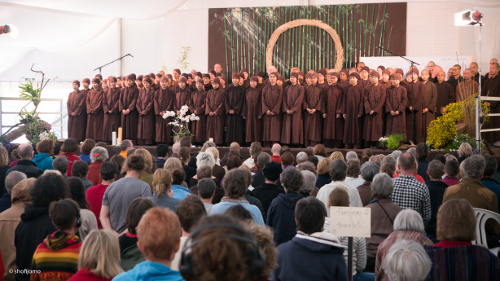 Talk by experienced Dharmateachers from the Plum Village tradition with afterwards practices (like walking meditation, mindful eating, relaxation) with the monks and nuns of the EIAB and Plum Village. The adress is: Schaumburgweg 3, 51545 Waldbröl. You can get of in Schladern. In Schladern we will drive shuttle busses from 08:30 till 09:30 (€5 per Person per drive). At the end of the day at 17:00 our shuttle busses (€5 per Person per drive) will drive to the station in Schladern. Busline 530 drives from the bus stop Kreissparkasse on the Kaiserstrasse (direct underneath from the eiab) at 15:16 and 17:16 to station Hennef. Busline 342 drives from Waldbröl busstation at 15:00 and 16:00 to station Schladern. Other destinations and times are possible by taxi: 02291-22 22 or -44 44 or -55 55. The normal ticketprice is €29. A ticket with discount for people in a wheelchair and students till 30 years old (please show your student ID) is €24. Tickets can be bought online! As long as we have tickets, we will sell tickets. These can only be paid in cash.